MARIE O'DAY, a nightclub entertainer, was killed by her common-law husband, who stabbed her in the back and cut her throat (for which he was sentenced to ninety-nine years in the Utah State Penitentiary). 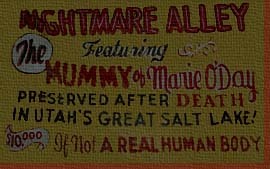 He threw her in Utah's Great Salt Lake, where her body remained for twelve years. It had washed ashore but remained covered with salt, silt, and sand. 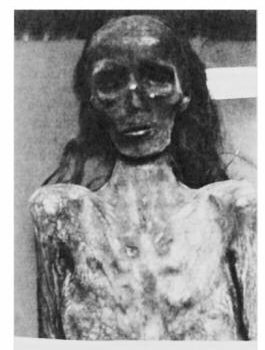 When discovered in 1937, her body was said to be "mummified, but not petrified" due to the more than 20 percent salt chemical content present in the water of the lake. A stitched incision in her neck appears to be a stab wound, and the stab wound in her back is also still visible. the mummy was exhibited by Charlie Campbell, Profess L.O. "Hoot" Black, and at least two other showmen. Over the years, O'Day toured thirty-eight states and Canada in the "Marie O'Day Palace Car." In 1955 the chief of police in Springhill, Louisiana, vouched for the authenticity of the mummy in a letter to a fellow officer of the law: "The doctors and nurses here all agreed that the exhibit Marie O'Day was an actual body and was once alive." Admission in the early 1970s was fifty cents. "The remarkable thing is the hair is still growing," claims the advertisement. O'Day's body was said to be leather like "... you will see that the body is still pliable, you will note the beautiful red hair upon her head, which is still growing. The well-preserved teeth, you will see her finger nails, toe nails - even the corn upon her toe." The exhibitors offered an inspection to doctors, nurses, or undertakers who desired to convince themselves of the authenticity of the body. In 1975 Black sold the mummy to Captain Harvey Lee Boswell. Boswell took ownership of O'Day buy had to abandon her Palace Car in the adjacent state. He also removed her from the traditional casket in which she had been exhibited, having found that it offended the public, particularly the recently bereaved, O'Day became part of his Palace of Wonders, billed as "The World's Largest and Strangest Tented Museum. "She took a celebrated place among the sideshow's shrunken heads, five-legged and two headed animals, live snakes, and other exotic and domestic wonders. In the late 1980s Captain Boswell was contacted by a vice president of Ripley's Believe It or Not. today, in the collection of her Captain Harvey Lee Boswell.